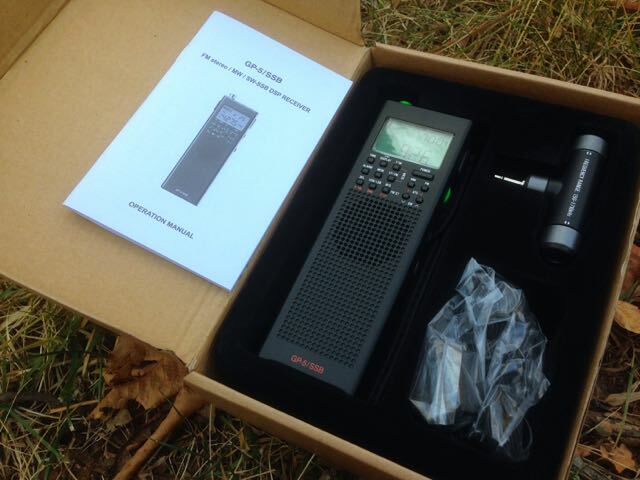 On Tuesday I received the new CountyComm GP5/SSB portable shortwave radio, a sample sent me from CountyComm. 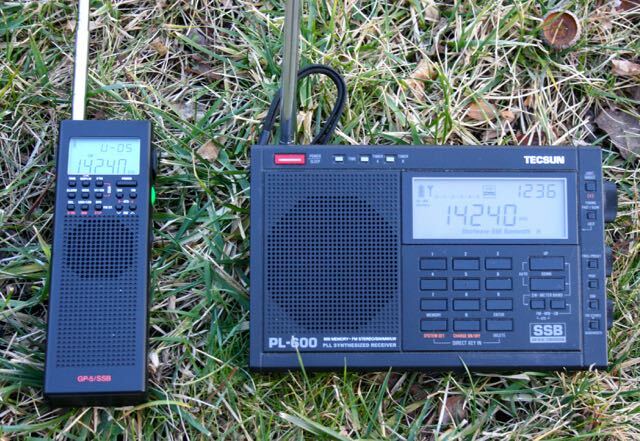 If you’re familiar with the current shortwave portable landscape, then you’ll quickly note that the GP5/SSB shares a striking resemblance to both the GP5/DSP and the Tecsun PL-360. While I hadn’t anticipated writing yet another radio article before the end of the year, having just published a lengthy review of the CC Skywave, my curiosity got the best of me…and before I knew it, I’d spent a few hours listening to and making notes about the CountyComm GP5/SSB as I put it through its paces. In the end, I found I had the makings of a review. Unlike most other brands I review, CountyComm has only one or two shortwave radio offerings. I wanted to know a little of the back story and motivation behind creating the GP5/SSB, so I contacted CountyComm directly and spoke with their representative, Nick. Nick explained that CountyComm is a retail distributor of products created primarily for US government use. In a sense, CountyComm is the consumer spill-over from the thousands of products intended, for example, for state and federal agencies. According to CountyComm, the GP5/SSB is a case in point. 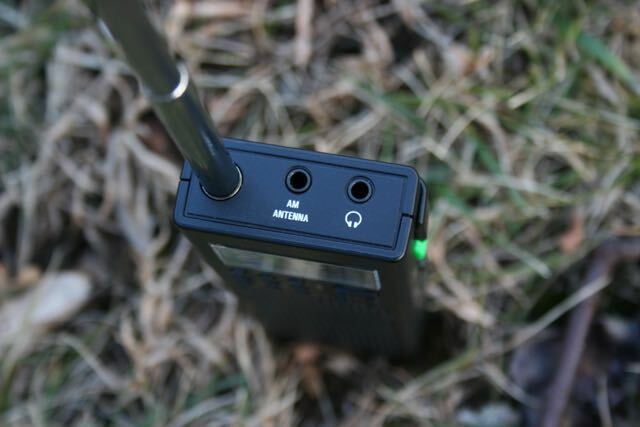 The company received a large order from a US government department for an “inexpensive, small portable, AM/FM/SW radio with SSB” for emergency supply caches and diplomatic posts. The GP5/DSP (a.k.a., Tecsun PL-360) fit the bill, but lacked SSB. The request was large enough that CountyComm approached SiLabs–manufacturer of the DSP chip in many of the portables on the market–and asked for help. SiLabs made some design changes and worked directly with the factory in China to produce the GP5/SSB. The GP5/SSB comes with a medium wave bar antenna, carry pouch, stereo ear buds, wire antenna and manual. Besides SSB, another interesting design CountyComm implemented was extending the upper frequency range of the GP5/SSB to 29,999 kHz; previous and similar Tecsun models only had an upper limit of 21,950 kHz. You may note that as of today, there are no similar Tecsun portables on the market–this is because the first batch of units were designed for (and all purchased by) CountyComm. However, I have already heard rumblings that there will soon be a Tecsun PL-365 on the market–if so, no doubt it will turn out to be the GP5/SSB. Appearance-wise, the GP5/SSB is nearly identical to its predecessor, the GP5/DSP or Tecsun PL-360. The vertical form factor is rather unique in the ultra-portable world, this radio is designed for one-handed operation, much like a handy-talky. The volume and tuning controls are on the right side of the radio and are designed to be operated by thumb (for right-handed operators, at any rate). All of the buttons on the front face are easily operated by your thumb–they’re small, but have a firm response. The GP5/DSP (like its predecessor) lacks a back stand, but does have a belt clip. The small internal speaker produces clear audio, but sounds a little tinny; there is not even a hint of bass. Via headphones, the audio quality is far better. 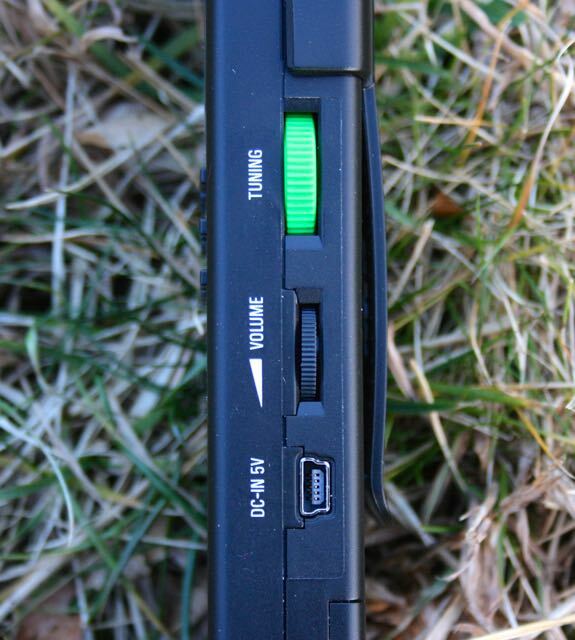 Besides a slight modification to the keypad layout to accommodate the new addition of SSB and a bright green antenna tip, the radio is identical to the GP5/DSP and Tecsun PL-360. The CountyComm GP5/SSB, like many other SiLabs-based receivers we review, has excellent FM sensitivity. While I have not yet had the opportunity to do a proper comp recording session with the CountyComm GP5/SSB versus comparable radios, I plan to do so in the near future…stay tuned for that, right here! I’ll create a post to give you a heads-up when I’ve added medium wave samples to this review. With that said, I expect the GP5/SSB performance on medium wave will be very similar to that of the GP5/DSP and Tecsun PL-360. I like the included rotatable ferrite bar antenna that plugs into an external antenna port on top of the radio. It certainly helps with both overall sensitivity as well as nullifying unwanted signals. I’ve had a couple of opportunities to compare the GP5/SSB with other portables on the shortwave bands; embedded audio samples follow of a strong station, a weaker station, and even an SSB sample. Note that all of the sample recordings were taken during poor band conditions–QSB (fading) is pronounced. Of course, when I received the GP5/SSB, the first thing I did was tune the ham radio bands in SSB mode. Nick, the CountyComm rep in charge of the GP5/SSB design, is an amateur radio operator, and I’m pleased that he represented the importance of a truly functional SSB mode on this radio. The GP5/DSP only has 1 kHz tuning steps: more than adequate for broadcast listening, but too coarse for SSB. 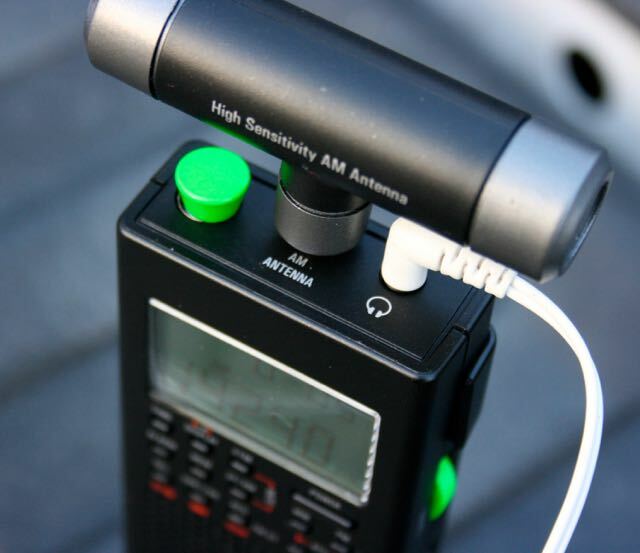 Amateur radio operators do not necessarily transmit right on a frequency; they’re often slightly off-frequency, either accidentally or intentionally. And older ham radios are also prone to drifting until the rigs have properly warmed up. Radios with SSB need finer-tuning controls to hone in on SSB signals. But the GP5/SSB has a work-around for this. The GP5/SSB accommodates SSB by allowing the listener to select either the upper or lower sideband, then use the BFO function to help fine tune and zero-beat a signal. Turn on either the upper or lower sideband, depending on the meter band (generally, 40 meters and below are lower; all else, upper). When you hear a signal, use the 1 kHz tuning increments to find where it’s strongest. Now, press the BFO button once to activate BFO tuning; the U or L (indicating upper or lower) will begin to blink. While the sideband indicator is blinking, use the tuning wheel to adjust the BFO. Adjust tuning until the voices in the signal sound natural. Once you’ve done this a couple of times, the process becomes second nature. Overall, I’m very pleased with the SSB functionality and performance. While I prefer either very fine tuning increments, or a separate BFO knob (no room for that on this tiny radio), I appreciate that CountyComm has used the BFO function to eliminate the need for a separate tuning wheel. While there are a number of portable radios with SSB on the market, there are very few in this $80 price range with SSB. Indeed, to my knowledge there are no other SSB-capable portables currently on the market that are as compact as the CountyComm GP5/SSB. I decided the best comparison radio would be one with a similar price, thus I used the Tecsun PL-600, which (at time of posting) is readily available from Amazon for the same $80 price tag as the GP5/SSB. You may notice that the GP5/SSB has a slightly higher noise floor and DSP artifacts while listening to the weaker signal. The PL-600 sounds a little muffled in comparison. I listened to many SSB signals that afternoon on the 20 and 40 meter ham radio bands. At length I concluded that I prefer the PL-600 for weak-signal listening. The PL-600’s AGC could cope with the QSB better than the GP5/SSB. With the majority of the SSB signals, however, I found that the GP5/SSB’s audio was clearer and voices seemed to “pop” out better than on the PL-600. I should note that I also attempted to include the Grundig G6 in this comparison, but the G6 somehow picked up noise from my digital recorder, thus making the recorded audio sound worse than it actually was. To my ear, the Grundig G6’s SSB reception was very similar to that of the CountyComm GP5/SSB–the G6 perhaps has a very slight edge in terms of weak-signal reception. Wednesday afternoon, I had the good fortune to tune in a relatively loud broadcast on 9620 kHz–turns out, it was Radio Nacional de España–! (This is a new shortwave relay service intended to replace the Radio Exterior de España (REE) service that ended in October 2014). As you probably hear in these examples, the GP5/SSB has fine sensitivity, though not quite as good as the PL-310ET. I’ve also noted good selectivity during casual broadcast listening with the GP5/SSB. However, I do not like the GP5/SSB’s AGC (auto gain control) as well as that of the other portables in this comparison–it’s a little too reactive to fading on the broadcast bands. To be fair, these audio samples really accentuated the AGC on the GP5/SSB since all were made during poor reception conditions and pronounced fading. Under normal conditions, I believe I would be quite pleased with the GP5/SSB; it’s otherwise on par with most of the other ultra-portables on the market. Supplied belt clip feels flimsy, if you plan to use this in the field, consider purchasing the excellent CountyComm GP5 series rugged case. Who should purchase the GP5/SSB? If you’re looking for an ultra-portable radio for travel and general broadcast listening, I would encourage you to consider the new C. Crane CC Skywave, the Tecsun PL-310ET or the Tecsun PL-380. Overall, the performance and form factor of these radios are a better fit for broadcast listening. If you’re looking for armchair SSB listening, a larger portable with a larger internal speaker such as the Tecsun PL-600 is a good choice for the same price as the GP5/SSB. If you’re looking for an ultra-portable radio with SSB, then the GP5/SSB is a very good choice (if not the only ultra-portable SSB choice currently on the market). While the SSB performance can’t compare with larger, pricier receivers and ham radio transceivers, it’s very good for $80 US. If you’re looking for an emergency communications receiver–something to stash in your vehicle, emergency kit or bug-out bag–the CountyComm GP5/SSB is a great choice and value. Indeed, that’s who the GP5/SSB was designed for; that’s why this rig has excellent frequency coverage in all modes, with good sensitivity/selectivity and designed for portable, one-hand operation. 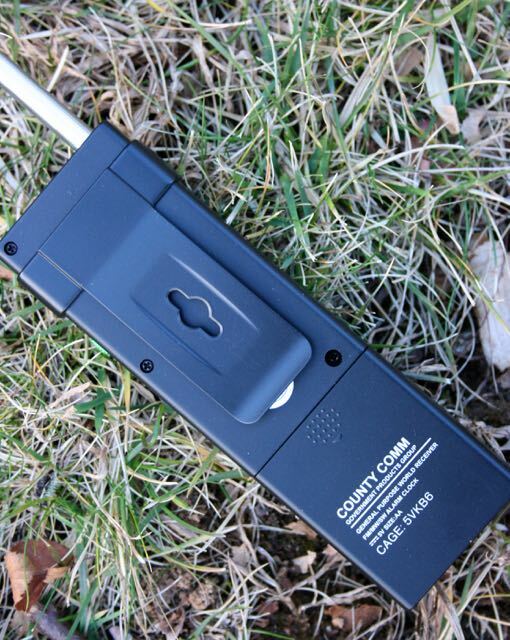 In fact, CountyComm has even designed and manufactured (in the USA!) a robust, protective 1000-Denier case for the GP5/SSB. This case makes it very easy to strap the GP5/SSB to your belt or backpack securely. In conclusion, the CountyComm GP5/SSB was designed for a specific purpose: to be an emergency communications receiver. It does this job quite well, despite any shortcomings in comparison to other popular shortwave portables, and for this purpose, I can recommend it. 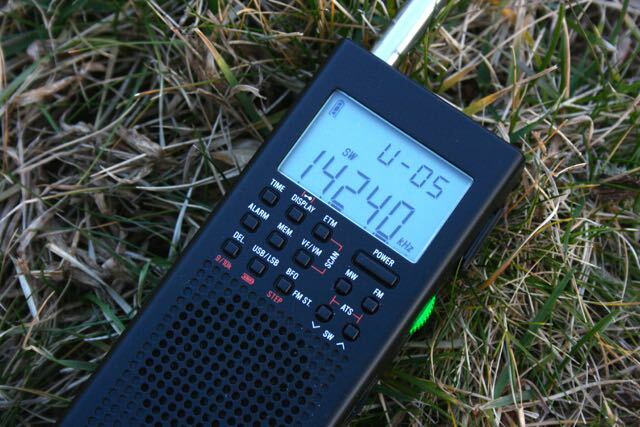 Purchase the CountyComm GP5/SSB from Universal Radio. This entry was posted in New Products, News, Reviews, Shortwave Radio and tagged CountyComm, CountyComm GP5-SSB, CountyComm GP5/DSP, CountyComm GP5/SSB, CountyComm GP5/SSB review, GP5-SSB, Shortwave Radio Reviews, Tecsun PL-310ET, Tecsun PL-360, Tecsun PL-365, Tecsun PL-600 on December 20, 2014 by Thomas. Okay – maybe I am starting to get the hang of this – did some more reading up on it. Anyone recommend frequencies that typically have a lot of traffic around them? I’ve read 7.10 mhz on LSB, and 14.200 for USB get busy. Thanks. Folks, I just don’t get how to use the SSB, U or L. First time user (just got the gp5). Guess I assumed when I pressed the USB/LSB button, that I would see different frequencies on the display than what I was on immediately before pressing the USB button. Also, is it possible to scan to “active” ham conversations? It looks like you can’t use the ETM function to add active conversations on USB / LSB, so it seems like the only way you can find them is manually through the tuning wheel. Pretty tedious. (My C Crane 2E lets me scam the HAM bands and stops at active frequencies). Thanks for any help. SSB uses the same frequencies as AM transmissions. The difference is in the transmitter taking the center and opposite side energy and adding it together on a Single Side Band. The SSB receiver decodes that signal by synthesizing the missing parts of the signal and restoring it as a demodulated audio signal. SSB signals depend on the receiver and transmitter holding the correct frequency accurately so that all of the modulation and demodulation results in a clear and understandable audio signal. SSB will get through static and interference that renders AM unusable. I’ve had mine for a couple of years now. I bought it because of the over-all superlative ratings it has received; and I wanted a unit this small. I’m certainly not a techie by any means, When I buy a piece of gear, it is for what it does; not what I can jury rig it to do. And if it does what it purports to do, it gets 5 stars from me. And as this is a radio, I understand the vagaries of reception. The problem for me is that this radio does not charge the batteries through its mini USB port. Nothing. Nada. No little lightning bolt to indicate it works and it does not work. When plugged into a PC as the charger, the computer does not even see it as plugged in. ie, no additional device attached. Using an AC as the charging source. again NOTHING. I thought no matter, I have other ways to charge AA batteries, from wall to battery to solar. However I’ve really come to resent the fact that I didn’t immediately send it back for a replacement. Pulling batteries out and putting them back in does get tiresome. Also I see two small square icons just the right of the battery icon (on Miklor) while I’ve never seen them on this unit. Over-all, I’d buy this again, but I would not accept it if it came as this one did. From all the reviews of County Comm I expected better. And that is where I purchased this unit, directly from their site. Aside: I purchased my order including 2 extra green tip antenna, and one of the better cases. I use the case it came with to keep those accessories in. And before I received my order, they had started to include this more sturdy case as a freebie. One would think that wasn’t out of the blue and they would have either just done that for an active order, or suggested I wait a few days for the temporary special. That would have been customer service. On my device, instead of the SNR display, the screen flashes there. I know that on version 1, the display is correct. I own the Tecsun PL 600 and like it just the way it is. It sounds and looks like this CountyComm gp5 radio in the review is even better than my Tecsun PL 600. On SSB especially and it is not like my Tecsun is bad in the regard of SSB at all. In fact the Tecsun PL 600 is at least decent in SSB receive. Looks like the CountyComm gp5 will be my next radio purchase. The next radio I buy. Has anyone used this radio for offshore weatherfax reception? Do the experienced SSB users think it will work when hooked up to a tablet with the right app? The County Comm GP-5/ SSB is a cool little Radio. Premium Larger Receiver in the $ 200 range using this Chip but having better Clarity and EFFECTIVE SYNC like the PL 660 but the Hardware Package of the PL 880. This little unit shows another implementation of the Silicon Labs IC- and the possibilities for a TECSUN PL 900 – going a step beyond the PL 880 in Clarity AND two steps beyond PL 880 in SYNC DETECTOR. You will definitely need an external antenna for a metal vehicle. The vehicle chassis and body will make an excellent counterpoise too. So then the question is “how do you get the signal into the radio while eliminating most the RF noise in the vehicle? Look at the second way. It is even possible to build that small inducttor to replace the tiny internal ferrite rod, but that then becomes a permanent modification to the radio. Either way, you must keep the wires as short as possible, because reducing stray capacitance maintains the full tuning range, important if you want to tune MW as well as get some of LW too. The neat thing about this DIY inductor is that one vertical whip should give you a decent performance on LW, MW and even VHF, but the balance of performance will depend largely on how long a whip you can get away with on your vehicle, and on how well you couple to its body for your counterpoise. I received this radio just before Christmas 2015. Bear in mind this is my first SW radio so I’m still learning. I’ve always wanted a good “world radio” for travel and I think I’ve found it. The fact that this radio has continuous coverage from 1711 to 29,999 KHZ makes this superior to many of the world radios out there that have gaps in their coverage. The sleep and alarm features make it perfect for travel. There is no “buzzer” on the alarm and instead turns on the radio so be sure to set to a reliable frequency that will be broadcasting when you need to wake and an appropriate volume that will wake you. So far I’ve listened to stations in Riyadh, Saudi Arabia; Ankara, Turkey, Bucharest Romania, Havana, Cuba including the so called “Cuban Numbers” stations, Australia and of course numerous stations in the U.S. including the “clocks” in Fort Collins Colorado. Given that I live in the south central U.S. all I can say is wow, simply wow! I do hear what others are saying about the FM sensitivity. On stations with strong signals playing music the output is distorted, particularly at low volume. I’ve tried removing the external whip antenna and didn’t notice a difference in FM performance. I’ve found not extending the whip is just as effective as is using the included earbuds and turning up the volume a bit. With my Bose headphones the distortion can be fairly pronounced as it doesn’t take nearly as much power to drive these headphones. Overall, this distortion only occurs when the broadcast is music. For talk stations (e.g. NPR) this isn’t an issue. This radio was clearly designed for listening to “talk radio”. County Comm is currently including a Maratac case for free with purchase of the radio. This case is really heavy duty. I removed the heavy metal belt clip and found a way to get the radio, external antennas and earbuds all secured inside the case. This makes for a nice 11 oz. kit including 3 – AA rechargeable batteries. Again, perfect for travel. For my first, and perhaps only, SW radio I couldn’t be more pleased. You say “I’ve tried removing the external whip antenna and didn’t notice a difference in FM performance.”, but in what context? It definitely works, if you have a good RF ground or counterpoise. A standard dipole raised above ten foot or so is enough to work extremely well. This is true for Tecsun PL-360 and PL-365 (I have tested both), and I doubt the CountyComm radio is wired differently inside. One possible reason for difference is that here in England there are a few BBC stations with hi-fi transmissions on VHF FM, and maybe the US uses that band differently. Even so the difference of over 20dB should be easily had, even if the broadcast format doesn’t make much obvious difference in stereo image quality. How much effect all this has if trying to DX long distance signals I don’t know, because the aim (and the good result) was specifically aimed at getting the best out of strong local hi-fi standard broadcasting. thank you very much indeed….!! These commenst do really have the merit…..
Set arrived on sathurday…. Fully happy on SSB…..
Nice, if it works with the whip, all’s good. If you’re listening on headphones you may find the stereo image narrowing as the IC tries to reduce noise in the case of anything but the strongest signals. I like the SSB version of the PL-360, better even than PL-880. With a bit of experiment, I think there are more advantages than shortcomings, unless we really need a big room-filling sound. The supplied external antenna, taken outdoors, really helped boost marginal signals to good readability. I am surprised and impressed the radio showed no signs of overloading and almost no broadcast band breakthrough – just one spot on 3rd harmonic of nearby 50kW AM station was heard, and it was not very strong. Cheap radios often come to pieces when you put any sort of real antenna on them, so this is another pleasant surprise. Again, it won’t win any awards for dynamic range, but it’s better than many inexpensive radios I’ve tried. As an aside, the AM antenna jack appears to go to the same input as the SW whip does, so you CAN attach an external SWL antenna with a mono jack into the AM in. However, according to the drawing in my manual there is a low-pass filter between the whip and the IC input that you will be bypass by jacking into the AM socket, so overload may be more likely. Then again, it might be fine depending on the particulars, so I’d say experimenting is worthwhile. UPDATE: Connecting both ends of a 25 foot wire to the jack in a loop configuration caused TERRIBLE overloading. 36 spurious signals going all the way into the 7 Mhz region. So, a big antenna should not go on this radio through the AM jack. It’s still OK for 25 feet of wire to the tip connector though. The modification I describe, removal of the internal whip, is aimed at getting a good stereo VHF signal, and is reversible without opening the radio. The person who posted that Amazon comment describes a loop. This radio’s AM tuned circuit needs an inductor which is either the internal ferrite rod, or the external one when plugged in. By making a large loop from tip to sleeve on the RF input, the inductance may have ended up within range for MW tuning and worked with the IC’s internal capacitance to produce a strong interference from MW signals into SW that may be a lot less bothersome with a whip or ‘random’ wire. An attenuator box with ESD protection is worth building because it can protect any RF input when using a long vertical antenna, many cheap radios don’t have this ability. I can only speak for myself, because there IS so much confusion. The internet is the murkiest invention of all time. I long ago decided to only post something if I’d tested it myself (Which of course means NO Wikipedia for me as they despise the one thing that would improve their site the most: original research! 🙂 But never mind…. The RF input on the PL-360 or PL-365 is the central one on the top end of the case. It takes SW and VHF input. If anyone says otherwise, they need to re-read the manual, and test the radio. You already know about counterpoises, so you already know why those who claim that VHF won’t work on that input are wrong. The odds are they didn’t provide any RF ground. 1 ) there is much confusion at one point…. here in Europe the information goes around, that MW and MW are working on the external antenna socket and….that the FM-tuner does not…. sorry you posted 2 messages…. I habe already seen the first….now…. What do you call the RF-Input in that set…..??????????? => is that a particular point (!!) on the circuit ? thank you very much for the explainations…. but…it is still not clear ( !!!! ) where to connect the wire when the Whip is totally removed, as you suggested…. The external antenna socket does not work for FM…!!!!! ( was affirmed…..true or not ? )…. Have not got the set yet, it is on the way to me…..
Bertrand, are you using a dipole or a random wire? If a wire, you may find the input weak because the radio’s own ground plane is so small. A standard half-wave 75 ohm FM dipole works wonders if you raise it above the ground outside a house. The downward pointing 1/4 wave length of it will be your ground, you don’t have to have an actual earth connection. It’s easier to make a dipole out of coathangers and a bit of wood than it is to make an actual earth ground too, which is useful. To the RF input. 🙂 It does work… I’ve tried it with PL-360 and PL-365. The antenna wiring internally is the same, and the external input is used for SW and VHF FM. With the telescopic removed, the sensitivity of that input goes up dramatically. I specifically did this for FM, originally, to get the signal strong enough to allow a clean wide stereo image. The IC makes that image narrow on weak signals, to try to compromise for low noise with at least some stereo separation, but I did not like the compromise, so I started exploring… Just using the external input helps, but not as much as also removing the whip at the same time! but where will I then connect my FM Wire, as the external antenna socket does not work in the FM mode ??? TWO WAYS TO IMPROVE PL-360, PL-365, GP-5/SSB. I’ve been opening a radio and taking photos, doing experiments… I’ll summarise the improvements, leaving out details. Try these things, you’ll probably like them. First, if you want good FM sensitivity, wide stereo, low noise, you may already have tried the external input with a good dipole, and wondered why it’s not as good as doing the same thing with a PL-390 (which is close to hi-fi quality on headphones when you do this). So find the small screw above the battery cover, remove it, pull out the internal whip. Remove it entirely. (This is totally reversible with no harm, so have at it). You should see as much as 25 dB improvement on the signal strength and get a sound quality that easily rivals the PL-390. The cause when the whip is stowed seems to be a cancellation due to residual VHF pickup interfering with the signal coming in on the RF input, due to some quirky internal wiring. By removing the whip entirely, you remove the problem entirely. This ‘explanation’ may possibly not be correct, but removing the internal whip certainly works to get full performance from the external antenna. The other improvement involved winding a BN-61-202 ferrite two-hole core for 560 µH using 36 turns, ideally with 3 strands of enamelled wire each 0.25mm thick, in parallel. This gets you a decent Q for good selectivity. Add a coupling coil of 4 turns. The main coil goes to the RF input, a mono 3.5 mm plug… The other goes to a 3.5 mm socket. You’ll need a small plastic box to make a neat job of all this. The result (minus one turn on the main winding if you’re in the US and want the top of MW, which is 1710, higher than the EU 1620 my 36 turns is specified for) will make excellent DX potential for MW based on a random wire input to the coupling coil, given a 6 foot ground rod under a 12 metre whip, for example. Coax with a type 43 ferrite bead or two will make a clean feed from the far end of a long garden. This coil will allow tuning down to around 270 KHz, so even if it won’t help with broadcast LW DX, it will help a lot for those of you who like NDB hunting, and using the SSB modes on these radios really helps with that, so this trick extends the capability of the radio a lot and also makes best use of what it has already. Best of all, neither of these improvements need any internal access to the radio. They can be applied immediate and with ease to any of these radios at any time and will do them no harm. Will this radio do LW reception? One of my hobbies is trying to listen for airport NDBs and I would like something very portable like this. It does cover 150 – 522 kHz in 9 kHz steps, but I’ve never tested it on LW. Might try to do so one evening, though there’s very little to hear in North America other thank beacons. It’s probably more or less deaf on LW just like PL-310ET, PL-380 etc unless you make another better antenna and plug that in. Yep it’s deaf on long wave, tried it myself now. On medium wave it’s not too bad for the size (with the extra antenna plugged in). Can the “fixed” internal whip antenna be replaced with one that allows for better angle and rotation positioning? Bob, while I’m sure it’s possible, I think it could be quite difficult. The base of the existing fixed whip is mounted pretty deep into the body of the radio–this gives it better durability. To mount one the top, you would have to figure out a way to make a sturdy connection on the existing antenna port. Excellent review. I have both the Pl-360 and the Countycomm GP-5/SSB. It seems to me that the GP-5/SSB has not only somewhat better audio, but it is also the more sensitive of the 2 receivers. I decided to see what was under the hood, so I disassembled them to have a look. As expected, the Tecsun PL-360 is using the Si 4734 chip. The GP-5/SSB is using the same chip that is in the Tecsun PL-880, which is the Si 4735. For those interested, I posted photos of the chips in the Pl-360 and the GP-5/SSB in the photos section of the Ultralight DX Yahoo group. The photo of the Tecsun PL-880 Si chip is in the photos section of the Tecsun PL-880 Yahoo group.